How can I reliably test my site on all old versions of Internet Explorer ranging from IE6 all the way up to version IE11? Hitting F12 on IE8 it should start the Developer Tools that allows you to emulate IE7 (not IE6) using the Browser Mode. I suppose on IE9 you will be able to emulate back at least until IE7, but I'm only supposing because now it irritates me the simple idea to have to buy W7 in order to test this. UPDATE: as specified by Jeff Atwood: IE9 emulates back until IE7 too. UPDATE 2: as suggested by Nick in comments below, if you want to be 100% sure to emulate the old IE browsers you can use VMs provided by Microsoft (incredibly they are also provided for free). As a side note, keep in mind that testing on VMs is more time consuming than using IE Developer Tools, IMHO VMs testing might be worth when testing something that's JS/CSS greedy like a web app or a complex website, not for simple sites that use jQuery and some CSS. You can also use the browser shots website if you are testing layout. You put in the url and it returns images of your site in a bunch of different browsers. Microsoft also released "Expression Web 4" which is for the purpose to compare different IE Versions. But you need to pay for it and you need a Windows XP SP3 or any later Win-version. Crossbrowsertesting was a site I tried for a while. Pretty good, you get a fresh browser install on a virtual machine you access over VNC. Useful, particularly for more dynamic sites. If you just want to check the design of your web pages on different IE browsers, try Browsershots or WebPageTest. WebPageTest is basically a free performance testing tool but if you select the "Visual Comparison" tab from their home page & submit a URL to test, the site generates expandable thumbnails of "above the fold" view of your web page and optionally a video of that webpage while it was loading. WebPagetest is an open source tool that you can install locally & run your own instance. 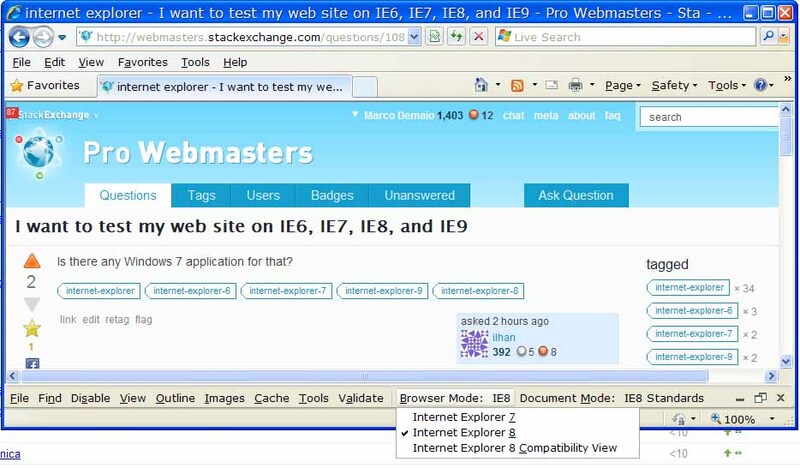 WebPagetest lets you test in IE versions 6 to 9. If you want to manually test the navigation & features of your site and not just the design & layout, install the freely available Virtual PC images of IE 6, 7, 8 on your Win 7 PC. Tools like IETester may not be completely reliable. I use VirtualBox to run copies of Windows XP with each browser installed on it. It's not 'ideal', but it works for me, and is very easy to set up and use. It is also likely the best reflection of what the browser is actually like on a particular OS. You can install IE 5,6,7,8 side by side on a windows machine or virtualbox windows machine. If you're alright with simply a visual check, you can use Adobe's BrowserLab. It's part of the CS Live suite of online services offered by Adobe. Right now you can get 12 months free membership of CS Live, so in the short term it's a good free solution. You can run tests on multiple browser/OS combinations simultaneously and see the rendering differences by comparing them side-by-side. There is Browserling which allows testing IE 5-9 and different versions of other major browsers as well, and all that from a browser of your choice! I'm using the spoon.net browser sandbox - http://spoon.net/Browsers. There is no substitute to native, hard boxes running the platforms you want. No IE-testing suite is completely accurate, and several will raise errors which don't appear in production (wasting your time on false positives). Virtual machines aren't as reliable as people think - I've seen several VM-specific bugs whilst trying to run IE6 (I think IE6's rendering engine relies on the coordination of certain threads, which VMs can't quite manage properly). If IE6/7 functionality matters to your organization, I think you can easily make a case for spending a marginal amount on two cheapo WinXP boxes. IETester is slow as molasses and crashes at the drop of a hat, and IE's 'compatibility mode' - whilst handy for a first pass - just isn't up to the muster if your customers really depend on your software working on their legacy boxes. Not the answer you're looking for? Browse other questions tagged internet-explorer testing or ask your own question. How do I create styles for IE7 (and below)? Has Microsoft stopped offering the free Internet Explorer Application Compatibility VPC Image for IE 6 testing? Does Spartan/Edge from Windows 10 use the same rendering engine with IE11?